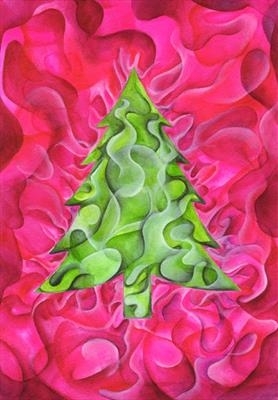 For multiple orders, have a look at '10 x Red and green tree' or contact me. This image came into being through a renewed interest in watercolour. After a long time of using mainly oil paints, I came across watercolour pens in my local art shop, which opened up a whole new way of working with this material. I had not thought that it was possible to build up such a good intensity of colour! The cards are litho printed onto 350gsm trucard with a silk finish. They are blank inside for your own message, and each come individually wrapped in cellophane together with a scarlet envelope. The colours come into their own in the evening light, when they really seem to glow.